This morning, just before 7 am, I met with Nollie Arguelles of the Cagayan de Oro Hotel and Restaurant Association (COHARA) and Mozart Pastrano of the Cagayan de Oro City Tourism Council for a walk through the town's largest public market, Cogon. I was eager to check out today's catch, as well as sample food served at the market. Our first stop was at Nanol's Cafe, where we enjoyed sikwate (a whisked hot chocolate drink) and puto maya (a native steamed rice snack categorized as ‘kakanin') prepared as you order. Nollie convinced the proprietor to let me have a go at making sikwate, so I tried my hand at vigorously stirring the dark, thick discs of tablea (unsweetened) chocolate with a batirol (wooden stirrer shaped like a large honey dipper) into a pot of water at a constant boil. Doing this constantly throughout the morning and afternoon rush requires some serious power! The puto maya was delicious, sweetened softly with coconut milk and rich with the earthy aroma of unhulled rice. Each grain had a slight bite to it - perfectly steamed, independent of every other grain in that large pot of rice. Here in CDO, puto maya is mainly composed of malagkit (sticky) rice mixed in a roughly 3:1 ratio with a glutinous purple rice (locally called tapay) grown in neighbouring Bukidnon province. Nanol's Cafe makes their puto maya with kakang gata (first-press coconut cream), ginger and a bit of salt and sugar. Each pot of puto maya needs at least an hour to simmer before serving. Moz explains that the first batch of puto maya goes on the stove at 1 am for the early breakfast crowd (often jeepney or truck drivers and other market tenants) and the second batch goes on at 7 am (for the remaining morning and afternoon customers). On shelves atop the counter, individual orders of puto maya were wrapped in banana leaves, ready to go for customers simply dropping by the market. My style of take-out! Our second stop was at Humbaan ni Aling Violy, where wesampled their specialty, humba (pork braised in stock, vinegar and spices). It fascinated me how so much flavour could be derived from a combination of so few ingredients! We met and spoke with Violy's youngest son, Lloyd, who runs the shop day-to-day. Preparing their humba employed cooking techniques handed down three generations of cooks, Lloyd explained. His great-grandmother instructed buying the freshest whole pata (pork leg from thigh to knuckle) they could find every day, to divide between two batches of humba for the afternoon and evening crowd. As I slurped rich, fatty pork broth in between spoonfuls of steamed white rice, I gained an incredible appreciation for cooks who deliver on calling a dish their specialty. The earnings from humba sold at Aling Violy’s stand have put Lloyd and his siblings through school, and have allowed the family to expand the business by providing a wider menu selection and counter space. Lloyd himself was incredibly generous with his time and answering my questions in the middle of his busy morning. After all, he cooks over 100 kg of pata every day for their humba, so I definitely appreciated his time. Our final stop was the seafood section of Cogon’s wet market. There was so much to see! Various species of fresh fish and shellfish were everywhere. There were stalls overflowing with freshly caught bangus (milkfish), malasugue (blue marlin), tanigue (kingfish), pidlayan (bullet tuna), galunggong (round scad) and kotob (a species I have yet to identify). The fish we inspected had ultra-clear eyes, well-rinsed gills and no odour of any kind. I wished I could note down exactly what types of fish were available across the entire market, and had information on how locals prepared them. I would have loved to sample each fish and note down their flavour profile - to understand why time-tested methods have worked so well for certain fish (as with inihaw na bangus, or grilled milkfish) and how newer cooking techniques and ingredient combinations can pair with staples of the Philippine shoreline (as with fried scad, or pritong galunggong). 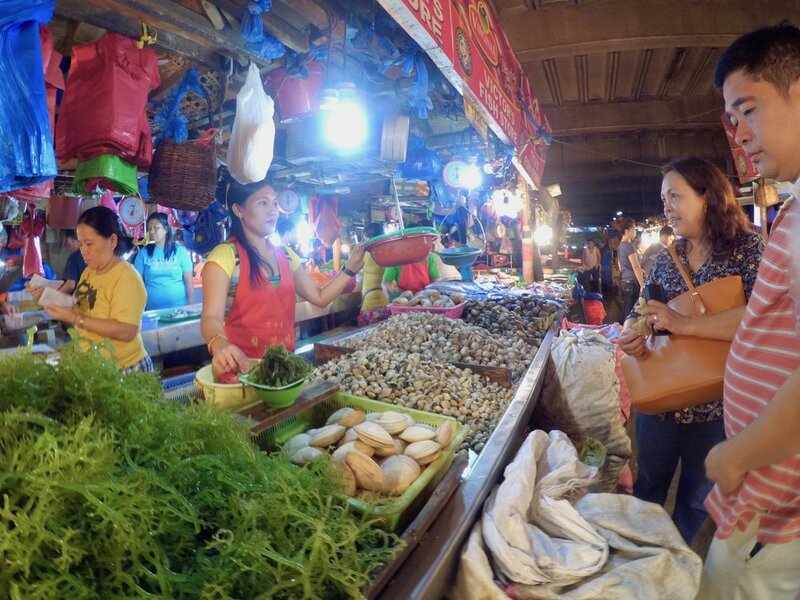 Vendors also sold shrimp that ranged in size from pinkie-length cocktail shrimp to 8-inch long deep-water prawns. There were a few who sold only squid, some so young they were translucent, alongside large, fleshy males with bulging ink sacs. Though some garbage was still visible along high-traffic areas, I did not encounter flies at all while we walked the wet market; an impressive measure of cleanliness. It was how a market should be!